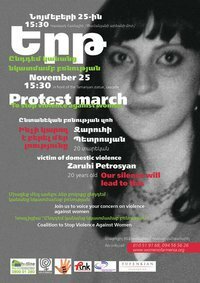 The Coalition to Stop Violence Against Women in Armenia has planned “16 Days of Activism to Stop Violence against Women” in memory of Zaruhi, due to take place from Nov. 25-Dec. 10. The coalition is comprised of seven NGOs: the Women’s Resource Center, Armenia; Women’s Rights Center; Society Without Violence; PINK Armenia; Women’s Support Center; Zangakatun; and Sexual Assault Crisis Center of Yerevan. The United Nations Population Fund (UNFPA) has also added its name to the list. “Maybe diasporan organizations should join as well,” said Lara Aharonian, the director of the Women’s Resource Center in Yerevan, in her statements to the Armenian Weekly. On Nov. 25, the first day of the protest, the coalition will begin accepting donations for a small fund to provide immediate support to Zaruhi’s family. They also plan on opening a bank account in Zaruhi’s daughter’s name, to provide her with a financial backbone once she turns 18. Zaruhi was herself an orphan, a fact her husband used against her when subjecting her to beatings. According to Zaruhi’s sister, Hasmig, the husband would brag about his cousin who held a high-ranking position with the Etchmiadzin police. Since his wife was an orphan girl, he”d say, he could do anything he wanted with her, even kill her, if he wished. An “unprotected child,” Zaruhi met an unusually cruel fate. Often, once children become too old for their orphanages”usually at 18″they are forced to fend for themselves. The future is quite uncertain for these girls, who often lack the required skills and connections to become self-sufficient, and who therefore opt to marry soon after leaving the orphanage. Now, this newly formed coalition is focusing on raising domestic abuse awareness in Armenia. “People still think that domestic violence is a private thing and not a criminal case,” says Aharonian. According to Aharonian, there are a number of things needed in Armenia: increased public and government awareness; economic development programs; and more service centers in major cities like Yerevan and especially in rural areas where circumstances are far worse for women. Forces must be joined with community workers, she says, to set up training programs for police officers, nurses, doctors, teachers, and social workers. Of course, a domestic violence law and a protection order must be adopted. “[The] Women’s Rights Center has one still pending,” says Aharonian. And finally, lobbying efforts need to be directed at female politicians to increase their focus on women’s issues. Aharonian believes that the diaspora can be a powerful instrument in encouraging development in Armenia; strengthening civil society; fighting for women’s rights, human rights, and gender mainstreaming; and joining the anti-corruption battle. Zaruhi Petrosyan died on Oct. 1. Her husband, Yanis Sarkisov, was subsequently arrested and faces trial. Soon after news of the circumstances of her death spread, a petition”"Armenia Must Pass Domestic Violence Legislation”"was drafted by Simon Maghakyan, a concerned diasporan, and signed by almost 3,200 individuals, though initially the goal had been to collect 1000 signatures. “I have received a letter signed by the chief of Armenia’s police headquarters indicating that the petition to the prime minister has been referred to them and that it has been forwarded to the Investigative Service within Ministry of Defense (which prosecutes crimes by military contractors. Zaruhi’s killer husband is a military contractor),” Maghakyan told the Weekly. However, Maghakyan fears this might pose a problem to Zaruhi’s case. “Yanis Sarkisov (who killed Zaruhi with his mother) is”a contract-based serviceman in the Armenian military. But was he on duty when he murdered his wife?” asks Maghakyan in a blog post. “They do not have, as far as I understand, any authority to prosecute Zaruhi’s other killer”the mother-in-law. Neither do they seem to have authority to investigate the possibility of the brother-in-law’s”involvement”(two specific demands that our petition made),” he adds. However, with the number of organizations monitoring the case, “the 16 Days of Activism,” and the amount of coverage the case has received from social networking sites and the media, the onus will now rest with the authorities to bring justice to this case, and to take the necessary steps”in sync with demands made by Armenia’s rights activists”to prevent such cases from happening again, and to swiftly adopt the much-needed domestic violence law.